Carla McGriff, 51, works in one of the fastest-growing fields in the country. As a caregiver for Allied Healthcare in West Hartford, Connecticut, she cooks and cleans for her clients. She feeds them and changes their clothes. She makes $13 an hour. As federal job reports highlight every month, the nation’s unemployment rate has dropped considerably since the Great Recession. Standard economic theory holds that, at some point, sinking unemployment will translate into wage gains: When companies have a smaller pool of talent to choose from, they tend to offer more attractive salaries. By the same token, when workers have a sense of job security, they’re more likely to ask for a raise. In 2014, the average hourly wage rose from $24.17 to $24.57 hour -- a 1.65 percent uptick barely keeping pace with inflation. Over the last four years, average wages have effectively remained the same. Meanwhile, the sectors that have added the most jobs are among the lowest-paying in the nation: retail, administrative and waste services and the personal and home care industry that employs McGriff. 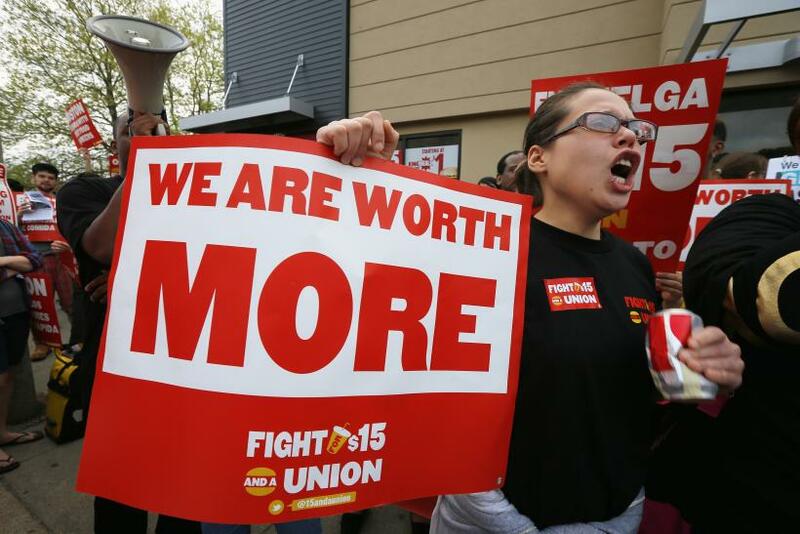 Is the long-promised pay hike ever coming to millions of low-wage workers like Rodgers? One issue, most economists acknowledge, is that the official unemployment rate masks a severe problem in the labor market: Millions of Americans have stopped looking for work and therefore aren’t counted as belonging to the labor force. Last fall, the labor force participation rate fell to 62.7 percent -- the lowest it has been since 1978. That means the real unemployment rate towers above the official rate. Baker does have some policy recommendations to speed up job growth: Governments could spend more; fixing the trade deficit by lowering the value of the dollar might help too. But overall he sounded a cautiously optimistic note that payroll gains will translate into wage gains -- eventually. “I haven’t run any empirical work on this, but I’d want to see the unemployment rate a lot closer to 5 percent, maybe even slightly below, before I would expect to see that we’d get significant wage pressure,” said Richard McGahey, an economist at the New School and former economic policy adviser for Sen. Edward Kennedy. Shrinking union density has boosted the share of profits going to bosses rather than workers, McGahey said. One recent study estimated the unionization rate hasn’t been as low since the 1910s. On top of that, increased reliance on the financial sector has discouraged corporations from investing in job creation. That means there’s less of an incentive to hire any workers at all. Richard Wolff, an economics professor at the University of Massachusetts-Amherst, said the problem with American wages is even more structural than that. McGriff, for her part, feels like she deserves a raise. She wants $15 an hour.